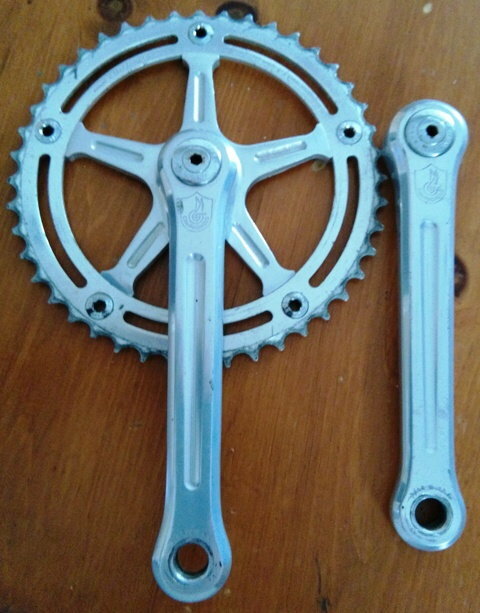 I have a set of Campagnolo Pista cranks which are a five speed set. I was about to polish them up. I have tried researching on eBay and elsewhere but only prices I can find seem very high. $100 for a used set of cranks? Is there something I am missing? Were Pista cranks rare? WGB, those look to be older cranks with a BCD of 151 rather than the later standard 144 BCD that began in 1967. 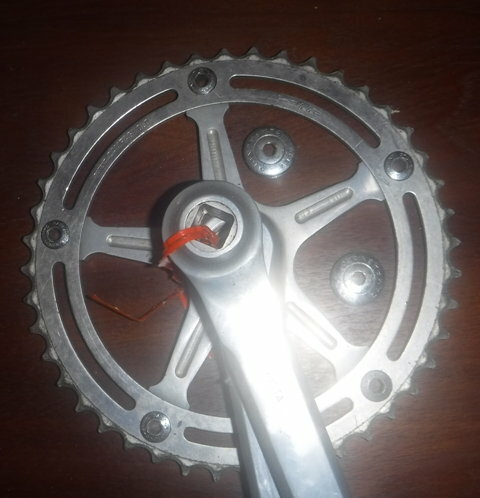 Look at the space between the end of the crank spider and the chainwheel bolts and compare to Campy cranks on Velobase. Yes, 151 BCD pista - not super rare but not a huge volume component. 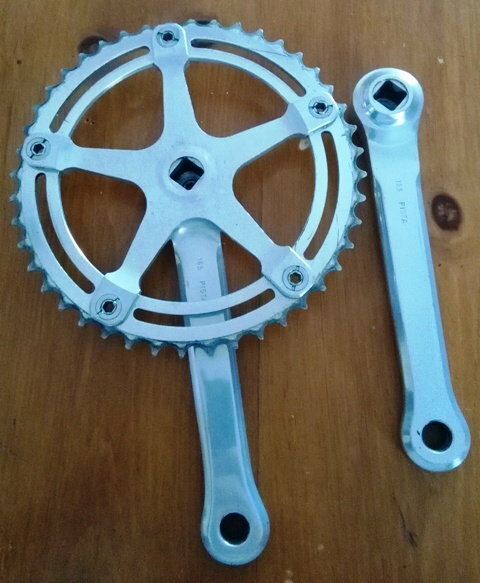 A bit of note on age- in 1975 I bought a new set with 151 bolt pattern - I could have had 144 BCD but bought the others as alternate chainrings - Campagnolo or Japanese alternatives were cheaper with 151’s and more plentiful. It slowly changed as the stock on the shelves was sold off. I get they are 151, but now I am confused because the spaces on the 151 cranks on Velobase are different than mine. I am referring to the semi circular cutouts. Here are the ones from Velobase for 151. Here are the ones from Velobase for 144. Since mine are stamped "Pista" could they be a more obscure example? I did find a chain wheel that was similar on eBay UK but that wheel was marked as Nouvo Record and Velobase has no reference to a Nouvo Record version (and it was 144). The Super Record version has no cutouts. The size of then obround cut-outs will vary with the number of teeth on the chain ring relatively to the BCD (Bolt Circle Diameter) diameter. Your chainring is a 44T, while the one in the 1st picture is a 50T equivalent (25T in 1" pitch is that same as 50T in 1/2" pitch). The 6T difference means a 3" larger outer circumference, assuming the same BCD. That is almost a 1" difference in diameter, so the obround cut-outs will be almost 1/2" bigger. Since they are Pista (i.e track) cranks, they are technically 1 speed, as derailleurs are not permitted on track bicycles and Pista crank sp[iders are designed to accommodate only one chain ring. Regarding prices, track equipment routinely has highly value because it was produced in much smaller volumes than road equipment. While rarity does not always mean increased value, it does in this case because of the high demand created by fixie and single speed riders. Still, I believe that Pista equipment prices have relaxed compared to what they were about 5-10 years ago. Last edited by T-Mar; 03-20-19 at 05:30 AM. I am seeing realized prices of$100 and up for sets that frankly seem rougher and more worn. Does $80 USD seem like a reasonable price for BF or am I bit low???!?? I wouldn't sell mine for $100. I feel like the prices on road cranks are low due to the abundance of supply and the 42 tooth minimum ring size. 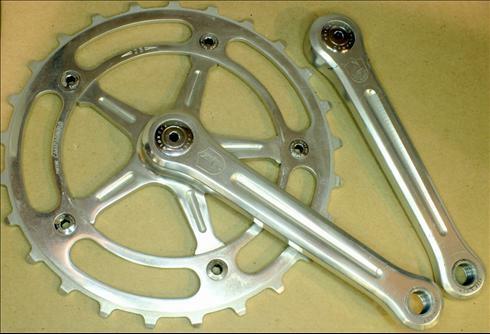 These were the most expensive cranks of their day, so compare with contemporary cranks at $400. As far as what someone would pay here, that's a different matter. Anything vintage Campy carries a premium. Track also carries a premium so it’s even more. 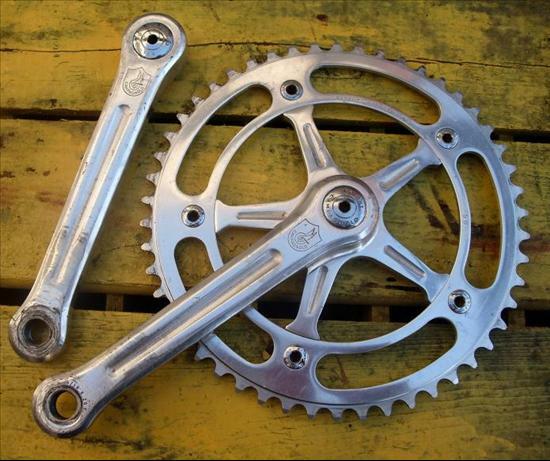 Not unusual to see vintage Campy cranks over $100. let sold items be your guide and condition drives price up. I let the Campy stuff help offset my crazy spending on bikes. So I rarely keep anything Campy. $80 sounds low and just is a transfer of wealth from you to the buyer. I’ll give a deal to friends and people who have bought from me in the past. Realize that no one will bail you out on your mistakes, so the good stuff IMHO has to generate some $$. Last edited by wrk101; 03-21-19 at 04:26 PM. Campagnolo can be a bit confusing if you do not know the history. For a time, strada and pista cranks both had 151 mm bolt hole circles. for 151 was 44 t, road or track. The very smallest Pista ring did also include an extra bit of material on the back side, for the larger rings, there was an chamfer transition from the thick to the thin areas. The most common use of a 44t pista ring was for tandems. The Pista rings and cogs were in 1/2" x 1/8" and for 1" block chain. Value of Campagnolo= condition, date code, presentation. 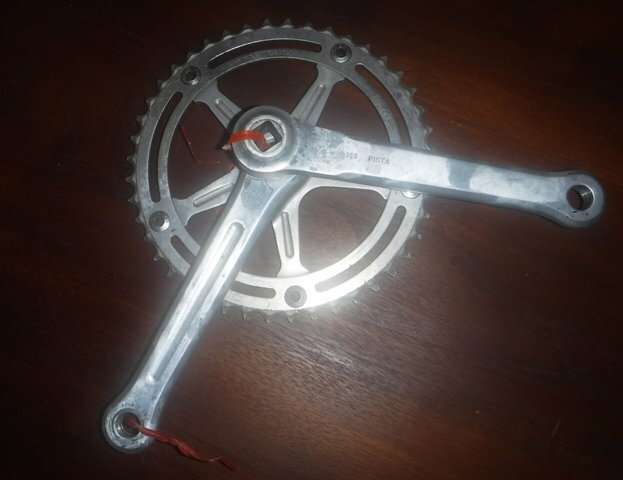 Cranks are only marked "165" and "Pista". I cannot find a date code (no number in a circle, diamond or square). Just added a few photos that have better detail. Thank you to all! Done and gone (I paid for the premium membership which is well worth it).